Happy World Kindness Day friends! Honey Bee Stamps has an incredible new stamp set for us today called You Are Loved. $5 from the sale of each stamp set sold through Honey Bee Stamp website will be donated to Rachel's Challenge. Please read more about this wonderful project HERE. This card is a single layer adhered to a white side fold card base but the colors and greeting pack a big punch. The new Geometric Background Stencil and rainbow-colored Distress Inks provide the perfect background for the You Are Loved sentiment. I started the card with a 4" x 5 1/4" panel of Bristol Smooth Cardstock and the Geometric Background Stencil. I used post it tape to mask off sections of the stencil and inked each "strip" with Distress Inks in Candied Apple, Carved Pumpkin, Mustard Seed, Mowed Lawn, Salty Ocean, and Wilted Violet. I removed the stencil, spritzed the background with water from a Distress Sprayer, blotted the background dry and stamped a greeting from the You Are Loved Stamp Set with Versafine Onyx Ink. I love that you can mix and match the sentiment(s) to say exactly what you want to say. I love the size of the greeting(s) and how it's the star of the show. I will be making many, many of these cards to have on hand. Love this stamp set so much. I finished some of the hearts with a layer of Nuvo Crystal Drops in White Blizzard and added a scattering of Nuvo Crystal Drops in Red Berry, Ripened Pumpkin, Dandelion Yellow, Apple Green, Midnight Blue, and Crushed Grape to complete my design. Orders of $100 or more will receive all the goodies mentioned above plus an extra free surprise gift! Free items automatically added to orders. Available while supplies last. Our world needs more kindness – now, more than ever. 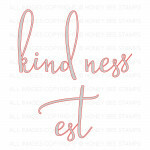 Here at Honey Bee Stamps, we love spreading kindness. So today seems like the perfect day to share a little extra! Today I'm sharing a kindess card with the Kindness Stamp Set and coordinating dies, and pairing the greetings with the Zen Floral Stamp Set and Busy Bees Stamp Set. Rainbow makes everyone happy, right?! 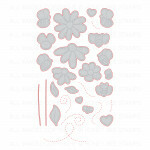 On a 4 1/4" x 5 1/2" piece of Bristol Smooth Cardstock the border from the Zen Floral Stamp Set was stamped with Versamark Ink and heat embossed with white embossing powder. The florals were colored with Zig Clean Color Real Brush Markers and the background along the bottom edge was watercolored with water brush pen and marker. To divide the top from the bottom without the addition of multiple layers, a thin strip of dark gray cardstock was adhered right above the floral watercolored border. The word, "kindness" from the Kindness Dies was die cut from cardstock adhered to Fun Foam with Stick It. Each letter of the word was inked with a Distress Ink in rainbow order! I adhered the die cut word right above the gray strip as shown. 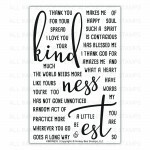 Additional greetings from the Kindness Stamp Set were stamped above the die cut greeting with Versafine Onyx Black Ink. 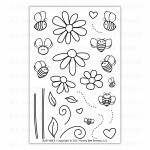 Bees and dotted "bumblebee trails" from the Busy Bees Stamp Set were stamped with Versafine Onyx Black Ink and colored in with Zig Clean Color Real Brush Markers. The bees were finished with a layer of Glossy Accents. Additional flowers from the Zen Floral Stamp Set were stamped on Brisol Smooth Cardstock with Versamark Ink, heat embossed with white embossing powder, colored with Zig Clean Color Real Brush Markers, and die cut with the coordinating dies. 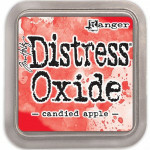 Today – Monday November 13th – we are offering our Kindness Stamps and Dies at 25% off. Don't forget to enter for your chance to win one of FOUR $25 Gift Certificates to our shop! Two more lucky winners will be chosen from the HBS Instagram page post – look for the “World Kindness Day” post on our Instagram page. Simply comment to enter to win! Thank you all for your kindness. I appreciate each and every one of you! Hello! Earlier this week I shared this trio of inlay style kindness cards on the Simon Says Stamp Blog and YouTube Channel using the November Card Kit, Kind Flowers. I absolutely adore this kit! So many amazing things you can do with it! HERE is a dimensional greeting die cut from a stamped image card I shared with the kit. I wanted to showcase the amazing specialty papers from the kit with my cards today so I used the Heart of Flowers Die to to create inlay panels and die cut the specialty papers to fit inside the floral shapes! Awesome texture and elegant kindness cards! I trimmed down the Dark Chocolate Cardstock from the kit to 4" x 5 1/4" and die cut the Heart of Flowers Die from the panel, discarding the inside pieces. Kindess greetings from the Kind Flowers Stamp Set were stamped below the die cut heart using Versamark Ink and heat embossed with antique gold embossing powder. I used the Heart of Flowers Die to die cut the three specialty papers included in the November Card Kit. I backed the panels with foam tape, flipped them over and placed the die cut pieces inside the flower and leaf shapes for the inlay design. I used a QuickStik tool for any of the super small pieces. I finished the design with Nuvo Crystal Drops in Silver Lining, Copper Penny, and Antique Rose. I peeled the backing paper off the back of the panel and adhered each to a cream cardstock card base.